Much to the dismay of the Pittsburgh Penguins' fan base, Daniel Sprong has been sent back to Wilkes Barre to play in the AHL. As expected, many became #MadOnline. "How could they do this to him?" "He is what this team needs!" "He is better than Sheary! Sheary should be benched!" "Get rid of Reaves, keep Sprong up!" "He NEEDS to play with Crosby!" "He is being wasted just like Pouliot...."
Okay....pump the breaks right there. 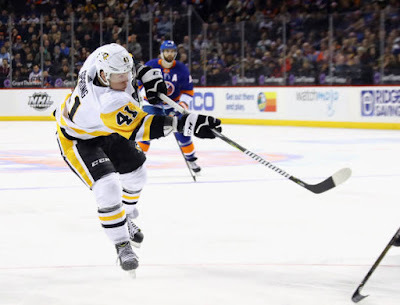 It didn't take very long, but fans are already comparing Sprong being sent back to development to how former Penguins' defensemen, Derrick Pouliot's situation was handled in seasons prior. First of all, Derrick Pouliot was given chance after chance after chance to prove that he had what it takes to be the top defensemen at the NHL level that everyone hoped he would be. Nothing sunk in. He worked with some of the best trainers and coaches and it still didn't work. He kept making the same on-ice mistakes in Pittsburgh and he is continuing those mistakes over in Vancouver. Sprong, while reportedly a bit arrogant at times, is young and teachable. He doesn't strike me as the type to get set in his ways and think his way is the only way. Secondly, let's stop pretending like Sprong being sent back to the AHL is some sort of big shock. With J.S. Dea brought up to take over the 3C position, it put Jake Guentzel back at his usual position on the wing. Bryan Rust is also poised to re-join the line up, who carries with him much more experience. That left really no choice: for now it's "Sayonara, Sprong". "But he plays so well with Crosby!" Who doesn't? Sidney Crosby has that special touch to elevate the playing ability of anyone he shares a line with. Yet, once players leave his line, their true shortcomings are exposed. Look at Conor Sheary for example. Once taken off Crosby's line, his scoring touch that was found in so much favor last season all but disappeared and he gets swallowed up by defensemen. With Sprong, the situation is a bit different. Though he can skate and score, he lacks in the area of defensive skills and his ability to play 200 feet. Being able to have an aggressive for-check is as valuable an asset as any well rounded forward can have. Take Carl Hagelin for example. His scoring may not be where it should be but he is, by far, one of the best for-checkers in the league, if not the best. Sprong, for whatever reason, doesn't like to play defensively. That issue was beginning to show at certain points in the games following the Penguins 4-0 victory over the NY Islanders on January 5. However, when the Penguins played the Anaheim Ducks on January 17, as soon as Sprong was put on the defensive side of the puck, he would bail on it, and basically hang around for the puck to come back into the offensive zone. Head Coach Mike Sullivan, it seems, was not pleased, and benched the young man for the remaining two games of their west coast swing. There has also been mention about Sprong's attitude being a bit, self-centered, at times. A bad attitude towards coaches and in the locker room can be lethal and HCMS does not put up with it. That could have also been a contributing factor of his demotion back to "the A." Sprong still has some growing to do. To describe him at the moment would be "consistently inconsistent." As much as everyone would love to have in the line up right now, and as much as some people want to think that he will be the Savior of everything that is still wrong with the Penguins game play, the fact is that he isn't and isn't going to be. Being sent back to the AHL after one call up is not a death sentence. It's better for him to play and work on what needs worked on instead of having him ride the pine pony. Sullivan says the #Pens want Sprong to play and not sit on the sidelines, regarding why he was sent to WBS. Sprong will have another chance, probably a lot sooner than we think. If he doesn't, it will at least give him a full development season and even perhaps a playoff run in the AHL to get him ready to make waves come training camp and make the big club directly. And that's not a bad thing. Good. Get Sprong back to the AHL so Guentzel or Sheary can plan on Sid's line. It's good for my draft. Wow, I think I found a good and interesting story.